At //Build 2016, we announced the availability of Pivotal Cloud Foundry on Azure as a single click Azure Marketplace solution template. This blog post provides an overview of this Marketplace solution and the getting started information. For those who might not know, Pivotal is the company behind Cloud Foundry, an open source Cloud Native Platform that is quickly gaining momentum with Enterprise Java developers as one of the best place to run Java based Microservices. Cloud Foundry is IaaS agnostic and supports multiple languages. We previously announced the general availability of Cloud Foundry on Azure. In the short time since we announced the preview of Pivotal Cloud Foundry we have seen a lot of customer interest. 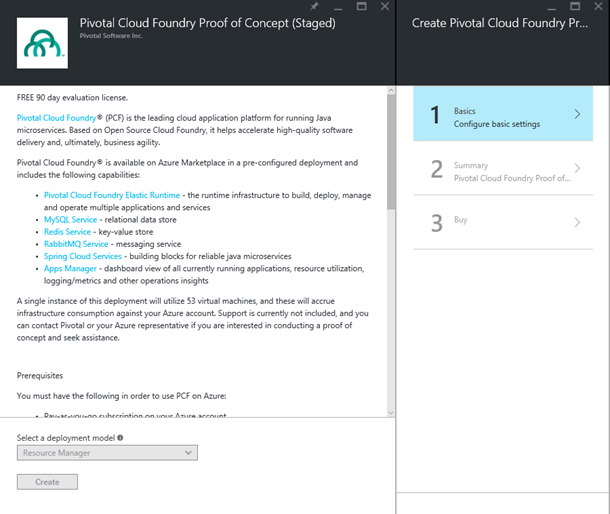 Pivotal has been working closely with us to deliver a solution that dramatically simplifies the initial installation, enabling even more Azure customers to try Pivotal Cloud Foundry. One of the working sessions was a joint hackfest with Pivotal on campus here in Redmond in February. Having gone through deployment experience as part of that, the value proposition of this single click template has become very clear to me. Easy and Quick deployment of Pivotal Cloud Foundry on Azure, comprising of 53 VMs (35 for PCF and the rest for validation), IP addresses and storage accounts. Create a secure jump box in the cloud to manage Bosh and cloud Foundry VMs. Elastic Runtime, Apps Manager, Redis, MySQL, Rabbit MQ and Spring Cloud Services all installed as part of the deployment and ready to use. With this integration our goal is to make it easier for our customers to deploy Pivotal Cloud Foundry on Azure and benefit from Spring Boot and other micro service frameworks that are natively supported on PCF. Want to get started? Here is the link, give it a try! We would love to hear your feedback, so please send us your suggestions and feedback.